The first phase of the Hiberno-Norse coinages were imitations of contemporary Anglo-Saxon coins. 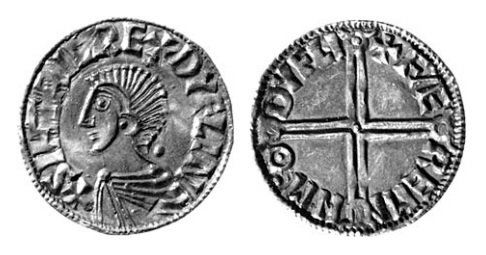 They were produced in Dublin but closely copied the style of the silver pennies of Aethelred II of England and his successor Cnut. Since the English coin designs changed periodically, the dating and sequence of their Hiberno-Norse equivalents can be identified quite accurately. These early coins were minted under the authority of Sihtric III (a.k.a. Sihtric Silkenbeard) King of Dublin. Sihtric was the son of Olaf Cuarán, Norse King of Dublin, Northumbria & York (ruled c. 989-1036). Sihtric’s mother, Gormflaith, was an Irish princess, daughter of the king of Leinster in the southeastern part of the island. The Irish coins are made of good silver and are usually signed in Sihtric’s name and by a Dublin Moneyer so this is not an attempt at forgery but instead it is a pragmatic approach to produce coins with designs that would be widely acceptable throughout the Viking world but particularly for trading with the Vikings of the North of England and the Anglo-Saxons themselves. It is during the Long Cross issue of the Hiberno-Norse, Phase I series that unusual but distinctive numismatic ‘anomalies’ occur. These two coins are struck from well executed dies and have characteristics similar to those of the Long Cross issue of Sithric – except that they are issued in the names of Thymn and Ogsen. The enigmatic issuers are unknown to history other than from their coins. Hiberno-Norse. 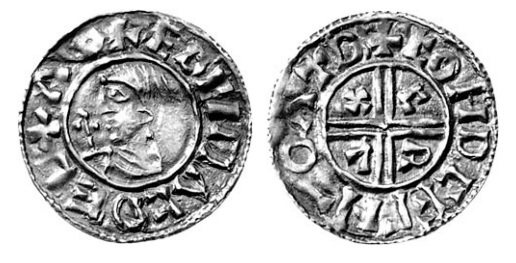 Phase I (c.995-1020) Penny in the name of Sihtric Anlafsson c.1010-16, Dublin mint, S-6117, DF-18, MS63 PCGS. + SIHTRY REX DYFLNIIΘ, bust left / + SIHLΘDIL MII GIHLI, short cross. An imitation of Æthelred’s last small cross coinage, this example is exceptional in its strike and surfaces. The legends, although difficult, are legible and the portrait is excellent. The flan is of good metal without cracks or flaws, exhibits upturned rims + one small peckmark on the reverse. Rare. Quatrefoil is the rarest of the five ‘known’ Hiberno-Norse types in Phase I. These thirty coins are struck from sixteen obverse and reverse dies, which suggests that we know a good proportion of the dies originally employed in the coinage. Since the sample is relatively small, a statistical estimate of the original number of dies used cannot be made with a high level of confidence. However, the figures indicate that there were in the order of twenty-five obverse and reverse dies. This fairly small estimated number of dies does not appear merely to be the result of a limited group of coins having been exported to the Northern Lands, for each of the five coins with putative find provenances in the British Isles is die-linked to coins found in Scandinavia. It is unlikely, therefore, that more than a few dozen Quatrefoil dies were ever employed at the Dublin mint, a figure that is comparable to the estimate for the earlier Helmet issue, although considerably smaller than the number that must have been used in the Crux, Long Cross and Last Small Cross issues at Dublin. We are thus dealing with a very small coinage, and its rarity today is not due merely to a paucity of finds or to a dwindling of the coin export to the Northern Lands. Only six of the obverse dies (HN4-7, 17-20) carry the name of the Dublin king, Sihtric. and the others are essentially illiterate. Two Dublin moneyers are named on the Quatrefoil coins. It is found in each of the five issues of Phase I and repeated on coins of Phases II and III, thus spanning a period of some fifty years. At some stage the use of the name evidently became merely an immobilisation, and the rather illiterate forms observed here suggest that this had happened already by the time of the Quatrefoil issue. In the case of the second name, we can be reasonably confident that it does represent a moneyer who was active at this period. Stegn or Stegen (ON Steinn) is recorded in both this Quatrefoil issue and early coins of Phase II. It seems that when ordering dies, Stegn was rather particular about the form and accuracy of the legends. One of his pairs, of typical later Hiberno-Norse style, has an obverse reading +ZIHTR C RE + DYFLMO , rather than the more usual Cnut legend. The reverse also has a somewhat pedantic inscription, +ZTEGE N MO N O N D (‘Stegen moneyer at Dublin’). There is also another variety which should be listed as a separate type in my opinion. It’s a CRVX type but with a right facing bust instead of left. Many thanks for your constructive critique and comments. Do you have any photo’s or links to an auction with the coin illustrated? I’m trying to put together a checklist for Irish collectors and overseas detectorists, to help them identify their hammered coins. There is one published in Roth’s Hiberno-Danish Coins in the 1910 BNJ, pl. I, 13. It’s in the name of Sihtric, moneyer is Azcetel, Dublin mint signature. I also have one in my collection and may be able to provide a photo, as long as I get credit for the photo. As far as I am aware, these are the only two known. there has never been an auction appearance of one.